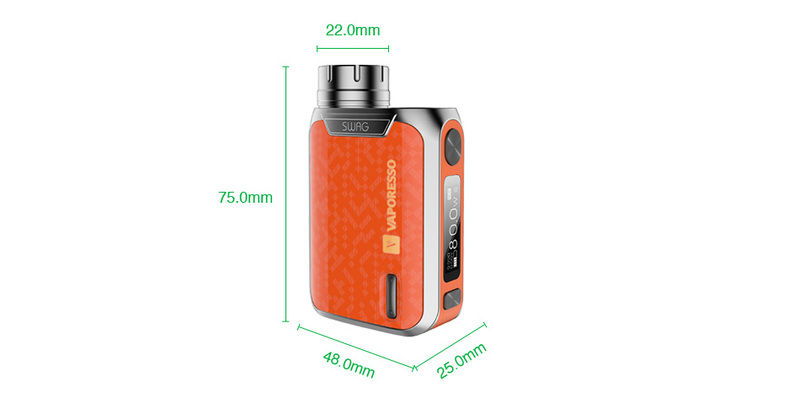 The Vaporesso Swag TC Kit comes with a 80W SWAG MOD and a 3.5 NRG SE Tank Standard Version (or 2ml NRG SE Mini Tank TPD Version). Just like the Revenger, the SWAG also has a OMNI Board 2.0 chip and supports various vaping modes - VW(H/N/S), CCW, CCT, VT(NI,TI,SS), TCR(M1,M2), RTC and BYPASS. It adopts the IML(In Mold Label) design for greater wear resistance too, making the SWAG a durable device. Paired with the NRG SE Tank, it has a twist open filling design and adjustable bottom airflow. The NRG SE is compatible with GT cores for different vaping experiences. Available in 4 colors. Please Note: Warning! You must be 18 years of age or older to buy electronic cigarettes or e-liquid. This site and it's services does not make any medical claims for products advertised on this site, therefore information or products should not be used to diagnose, treat, cure or prevent any medical condition or disease. We recommend you visit a health care professional for advice, before you use any of the products for sale. We are not a Pharmaceutical company and do not produce or sell medical products. Electronic cigarettes and e-liquid are sold as, an alternative smoking option.